So, here it is, it is Monday. Since it was my last week of work before embarking on an adventure to move my career forward in the fields of Organizational Development, I went to work and was diligently putting together standard work for all my job functions, cleanup files, plan what else needs to be done. Go to the chiropractor to get rid of severe pain between my shoulder blades, then go home and start to organize for our upcoming move. I enter the house and say hello to my Coco in the kennel and she just looks at me with a sad look…. I went to kick my shoes off and notice that the front door is cracked open…. Weird. Denny, my husband, ran to basement to check on Brian and ran back up worried because he wasn’t there and told me to check upstairs. I started freaking thinking someone came in and kidnapped him, but when I didn’t find him, his iPad, his phone, nor his clean jeans that were on the floor…. And then….. My heart skipped a beat when we called his phone and it immediately went to voice mail- it was off. Then we sent text messages to family and friends that were in central Illinois asking if they took him somewhere or heard from him…. No on both. While I called 911 and explained the situation 18 year old with Asperger’s, no government ID, no credit card, likely headed to LA unsure of how…. My husband was calling the airport and got nowhere due to the privacy act (who else thinks the HIPPA privacy act is a PITA??) (if not sure what PITA – you fill in the last word… Pain In The A**.). 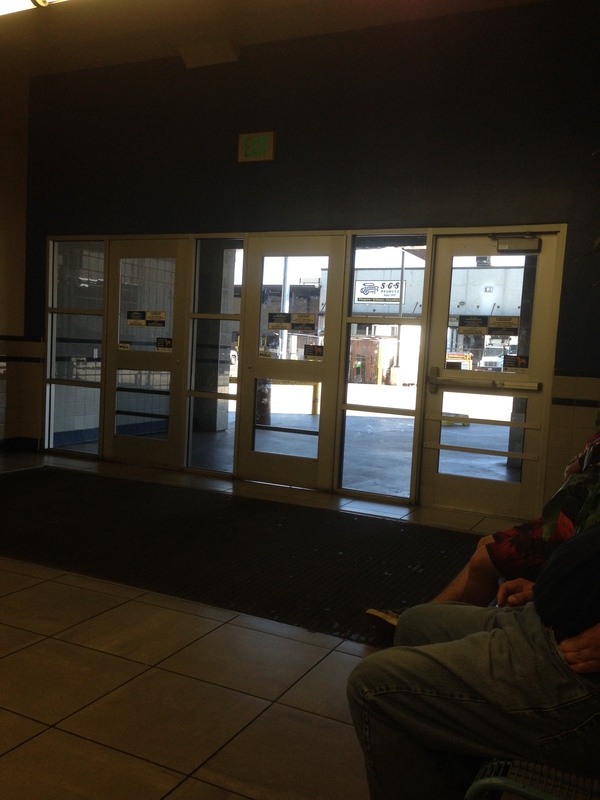 By this time my report was finished and I was listening for hope in my hubby’s conversation with the Amtrak station. I was hearing hope from the lady who understood his pain and worry, unfortunately it seems she didn’t know much about their system… “I see he purchased a ticket through the app via Galesburg but they wouldn’t let him on without photo ID so it was cancelled.” “Oh wait that was on August 1st, uhm, oh yup, same thing on today. You need to call Amtrak police and they can track this better and find him. Then she kept talking for like, FOREVER. So hubby handed me the number to call when it became apparent that this gal didn’t realize that he can’t call the train police when he is on the phone with her babbling about different scenarios of what he may or may not have done…. The Amtrak police were of little assistance telling me I need to file with local police.. “I just did, can help me before they get her to write it?” “No they will put out an alert and we will respond to that”. To me this was, “I’m really busy playing candy crush, about to beat level 141, and I don’t have time for your missing 18-year-old and I really need fired.” So I hung up and hubby STILL on the phone with the lady at Amtrak. He told her we called and they wouldn’t do anything. She then, bless her heart, asked Jason (last name unknown) to check the train and report back. Well, apparently Jason was busy reviewing what’s for sale in online Facebook groups because he NEVER reported back. Ever, even when the police called-stellar job performance dude. So, the police show up two officers. They search the house and didn’t find him. They ask questions about why we were concerned and then call their commanding officer to confirm we have an endangered missing person. Then, more police showed up… just a few…. Anyhow, one officer was looking at his Facebook account for clues-recently added people on his laptop that was left behind, because he’s always logged in and likely didn’t take it because it is SLOW as crap, but we made do. I looked to see if I could get lucky to get into his email account but no such luck. One asked command to ping his phone no luck. They then asked for phone records for activity. While the other officer and I called people on his recently contacted numbers through our AT&T Billing, unfortunately it lacked the most recent 24 hours. (Side note: Sorry to the two friends who we freaked out a little!). 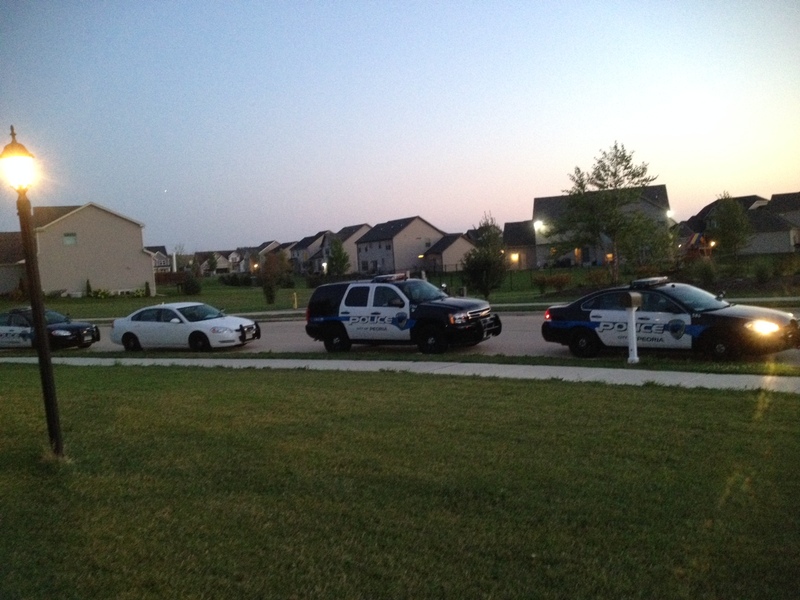 While this was happening, within 15 minutes three more officers, including their commanding officer, came to the house. The new policeman asked me if I could get into his email account or “find my iPhone” account. I told him I didn’t know the password. He asked if I could guess it. Then I thought of when Brian and I met my friend Jennifer at McDonald’s and he went to check his Facebook and was seriously typing for a minute straight. He takes passwords seriously. So our kitchen became command central. Each officer was calling a different entity. One officer thought of taxis and asked if we had a phone book. We actually had just gotten one the week before. He looked through a few seconds, then asked, “I know I’m not old school, but what would taxis be listed under in the yellow pages?” I laughed because I asked on Facebook several weeks ago who still used the book. So he found it and started calling. No luck. They contacted Amtrak to get ahold of Jason, who was busy looking for Brian and would tell him to call back. It’s amazing to me that the response to the police on the phone was little to no response. They contacted the bus station, no luck. So they decided to go out and canvas the area. Jason…. Must have gotten lost or something because he NEVER called back. By then it was 8:00 pm and it was just Dennis and I. While I was freaking out, he was hacking his email account. He had helped him set it up, so our email was the back up for lost passwords. Boom we were into the mail. Not much in the inbox, but found a reservation for a taxi he used to get to the bus station. We called the officer and advised. A little bit later, an hour or so, the officer called back and advised that the people at the bus station remarried Brian. 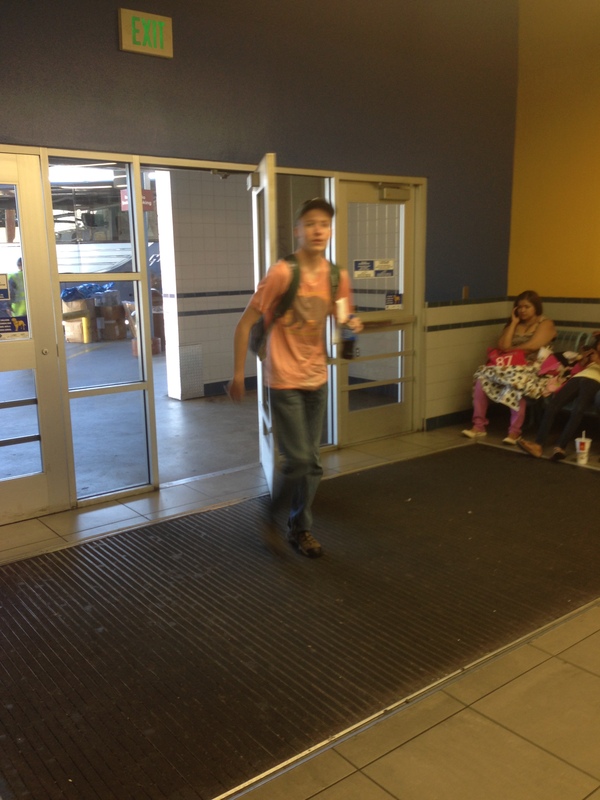 He came in and was holding the door for people and talking to them. (Is it bad that at this point I was extremely proud of him for being helpful?!) He continued on to say they were working on confirming that he was on the bus and would keep me updated. At about 11:00 he called back and said that he is confident he is on the bus and is working with St Louis greyhound and local police to assist. Although with the riots in St Louis he wasn’t sure how much help from officers he could get. He asked what they should do if it is him, do we have court docs indicating he can’t live on his own? I know so many recommended guardianship and I’ll explain in a bit why I didn’t do that. The officer and I discussed options and ultimately, I didn’t want them to detain him because he is 18, obviously determined and if forced to return he would likely just run again… I don’t want to do that because it would just frustrate him more. He said he likely couldn’t detain him anyways. I told him my concern was that (1) he was SAFE, (2) that we could contact him, and (3) through contact find out what he has lined up when arriving at LA. So they found him on the bus and ensured he was safe and recommended he turn his phone ON and contact us. Which he did and he kept in contact with us via text. We talked about what next? Would we come to LA? Would we let him find out himself? Could someone local meet him? We decided to have a local meet him so that he had some autonomy. At about 2:00 am Tuesday I went to sleep, then got up at 5:00 am to get ready for work. I’m one of those people that will drive myself insane if I don’t have something else to focus on. While I worked, my husband stayed home keeping in contact with Brian. My boss told me any flexibility I need to handle this, just do it. And I thought about it, but Brian didn’t arrive in LA until 330 pm Wednesday, so I had soak time. It wasn’t until I spoke with my other boss (Yeah, I have two…) Anyhow, he called me to talk to him. Not about meetings needed, or anything regarding work. Just to specifically ensure I was ok and if I needed anything. I told him I was ok, besides the fact that I had minimal make up on (foundation only) and frankly I had done my hair better to scrub toilets, I was ok and would feel much better when he got to LA and I knew he had a residence (not a shelter, group home) and was ok. Then he said something that flipped a switch. “You should be on a plane to LA. It’s not a good place for him to be alone. Don’t be sorry later.” Sorry, meaning my son is permanently missing or killed…. Then I got to my desk and texted Denny. “I’m going to la if you don’t.” He searched options, I searched options, and I left work because there was a 6:00 pm flight out. It was 2:30 pm and I realized when I got home I needed to pack, grab essentials Brian would need (SS card, birth certificate) and would surely forget something if I rushed/ you know…. like my clothes. Important stuff. There was a 6:00 am flight and I booked it. I told my hubby I didn’t care how much it cost because I would pawn everything so that I know he is safe- I didn’t want to call Melanie Schelling, my insurance agent to collect life insurance. I have never flown before alone, or driven in a humongous city like LA before… I won’t even drive in Chicago. :). So for me this was a new thing. I admit it, I was a little scared traveling alone, but had to keep my mind on the prize!! Not only was I afraid of just the travel, but also the fact that my flights could get delayed or cancelled them I would miss his bus! So if you know me… Ya know, I don’t like getting up early, early and being somewhere before like 7:00 am but I do what I need to do for the things I’m passionate about. (So all you Decatur Cat folks that saw me at the plant digging around in a cooler for your choice of soda… Know that it’s because I love you all!! And my hubby was on third shift for 9 years and I know he felt like the line ranger as far as things happening on his shift. Besides we had a fun time-serving dinners to ya!). So anyways, I set my alarm for 3:00 am. I got ready and while doing so, made sure I had everything we might need (SSN card, birth certificate, etc.). We got to the airport with NO time to spare, at 5:15 for a 6:00 am flight. Thank heavens for small airports and speedy processing, despite a change of security check in guards that delayed the line from moving for 10 minutes. Luckily, I had my shoes tied loosely, no belt, all my liquids in my carry on (no checked bags), boarding passes printed and license ready. So I made it… Now for a brisk walk to the gate, which for a small airport seemed like F.O.R.E.V.E.R. Away. But I made it, even got there before they started boarding. Yay!! I have never flown before alone, or driven in a humongous city like LA before… I won’t even drive in Chicago. :). So for me this was new thing. I admit it, I was a little scared traveling alone, but had to keep my mind on the prize!! Not only was I afraid of just the travel, but also the fact that my flights could get delayed or cancelled them, I would miss his bus! So if you know me… You know, I don’t like getting up early and being somewhere before like 7:00 am but I do what I need to do for the things I’m passionate about. (So all you Decatur Cat folks that saw me at the plant digging around in a cooler for your choice of soda at 3:00 a.m…. Know that it’s because I love you all!! ☺ Besides that my hubby was on third shift for 9 years and I know he felt like the lone ranger as far as things happening on his shift. Besides we had a fun time with ya!). So anyways, I set my alarm for 3:00 am. I got ready and while doing so, made sure I had everything we might need (SSN card, birth certificate, etc.). We got to the airport with NO time to spare, at 5:15 for a 6:00 am flight. Thank heavens for small airports and speedy processing, despite a change of security check in guards that delayed the line from moving for 10 minutes. Luckily, I had my shoes tied loosely, no belt, and all my liquids in my carry on (no checked bags), boarding passes printed and license ready. So I made it… Now for a brisk walk to the gate, which for a small airport seemed like F.O.R.E.V.E.R. away. But I made it. In fact, I even got there before they started boarding. Yay!! So on my flight from O’Hare to Los Angeles, it went really smooth and I got WIFI! So since we have iPhones, I could text back and forth with Brian and hubby! I kept up to date on where the bus was in relation to my arrival time. My hubby was pinging Brian’s phone/ipad with the Find My Phone app through iCloud. If you have apple products and haven’t activated that app… do it. Now, we had originally told Brian we would find someone to meet him off the bus. It WAS the original intention but, after talking with my boss… I decided… Ya know what? It’s gonna be ME!! When you want something done and you kept up to date, it is best to do it yourself. Besides, I couldn’t inconvenience any of my people in Cali. Please note that it was not my intention to drag him back to Illinois, it was to help him set up shop in Los Angeles. If not, help him determine the next steps. However, since he ran away, I didn’t want to post that on Facebook because I was afraid he’d dart and get on a different bus. I know a lot of Facebook people thought I was crazy for not going… but I couldn’t let the cat out of the bag. When he asked if we found someone, I texted him and told him that “I have two prospects – one will definitely be there on Wednesday. You’ll recognize either from Facebook, I told them to wear a purple shirt, so they will and will call out your name. They both have your pic. :). Where are you at now?” So you can see that I kind of avoided the question. Ha! I really wanted to say… “My plane is above your bus! Wave!” But I didn’t. So we chatted back and forth a bit, and again he asked “Who’s gonna meet me at the downtown LA greyhound station?” I responded “Leslie”. Then he asked “Leslie who?” And I tried to step dance around answering it. Luckily I had to put the phone away because my plane landed and needed to pick up my car, or I should say figure out how to get my car! I found the shuttle bus, got my car and trusted Siri to direct me to the bus station. I made it, Siri didn’t let me down for once. Then after taking in the scenery around the bus station, I checked my messages and responded. “Sorry was on the phone. She’s in a maroon Nissan Maxima, wearing a purple shirt & jean shorts. What’s your location now?” He was still about an hour out… and let me tell ya, I thanked my lucky stars I flew out because that area was rather scary. I was happy he arrived at 3:30 pm, in the daylight… Homeless people sleeping all along the road, in parks, under bridges and when there wasn’t a person there, their shopping carts full of ‘prizes’ were left. The buildings had bars on all the windows and quite a group of people to watch. I saw this one gal that was rather chubby, wearing what appeared to be a tube top… as a dress. I mean for real… She was well endowed on the front and the rear. If she would’ve breathed in heavy, she would have lost both loads. I should have taken a picture, but I didn’t to protect her identity. There was a security guard posted right by my car so I stayed there as long as I could. While I waited I called several autism resources in LA to see if they can assist Brian in either talking out a better plan or helping find housing. One of them I left a message and the others needed an address within LA in order to provide services. I found this rather odd, as if I am seeking out housing, I don’t have an address. At about 45 minutes till arrival, I went inside the bus station. Denny was pinging his iPhone and updating me on his location periodically. This feature came in handy because at one point, I asked, “Do I have time to pee? ?” He said yes, and I went! So when I finished with that necessity, I waited for the bus. It seemed like I waited…..and waited…. Then I started to worry I was at the wrong station, so to calm myself, I asked the lady at the counter if this was where route 1351 would arrive and if they were delayed. She told me she had no clue what route 1351 was….. So aggravating as later I found a board. They have one arriving daily…. Argh, good help is so hard to find. That’s ok, because I looked outside and realized, my wait was over, as the bus arrived!! I photographed the bus arriving and posted to Facebook so all my friends would know… Mom to the rescue!! So many were worried, so many had shared our missing picture and status and those that also shared it, who didn’t know us, were afraid for him. Since the original posting of the missing persons status, I had all my status updates as public. I know there have been times I have shared a status and you don’t know what ever happened – did they find them? So I wanted to be fairly transparent – except in telling everyone I was going to LA to meet his bus. That I had to keep a secret. Since it seemed like it took forever to see him get off the bus, I will tell you why I never went to get guardianship for my son. I am a firm believer that labels create limits. I have always told my kids that they could be anything they wanted to be when they grew up and I hoped that they would believe it too. When you have doubts, you can be your own worst enemy, keeping you from reaching your true potential. I was afraid of getting guardianship because I didn’t want Brian to think that I didn’t believe in him. Do I believe he can live on his own? Most definitely. Do I think he is ready now? No. I also know that he inherited my, what some would call stubbornness, while others would call it determination, goal oriented. What he wants he is going to go after and if someone tells him he can’t he is just going to show you otherwise!! Which in most cases, I would be so proud of him for being that way – independent. However, at this time, I knew he didn’t have a plan when he arrived as far as living accommodations and without a government issued picture ID and credit card, he wasn’t going to be able to obtain a hotel room, forcing him to sleep in a shelter or the streets. While I want him to learn about life, I don’t want him to learn about it in such negative ways that it scares the begeezus out of him. Remember he held the doors open for people? He is a kind person and I didn’t want someone to take advantage of that. Remember he had some cash on his person… So, in summary, I didn’t want to label him as needing a guardian. I think as parents we are always guardians, it’s our job to help teach them the ways of the world no matter what age they are. Labels can cause limits and I don’t want either of my kids to think that they have a limit to their potential… because they don’t. And, if you have teenagers, with Asperger’s or not, and lived with them when they are mad at you, because they aren’t getting their way… it’s not a happy environment! I want a happy home, not a hostile one. So, it probably took about that long as Brian was looking at all the bags, went back on the bus to see if his bag was there, but he came in with only his back pack. I started to worry about what his reaction would be when he saw me. Would he be mad? Throw a tantrum and run? Would he hug me? Or would he just say “hi”. As he walked in, the guy was telling him where to go to check for it. He was looking around, without his glasses on I am sure everyone was a little blurry. So, I called his name, and he walked up to me and realized it was me, he said, “Mom?!! How’d you get here so fast? !” And gave me a hug! Then I told him I flew because I wasn’t going to let him be alone in LA. ✈ I asked him if he missed me and he said yes, but he was just so shocked to see me! We went to the counseling office to speak to a counselor on what classes to sign up or, etc. They asked for his student ID, which surprisingly he didn’t have memorized. We needed that in order to speak with a counselor. They directed us to the kiosk and if that didn’t work, to the admissions office to retrieve it. We tried the kiosk but it was not helpful so we headed to the admissions office. The guy behind the window said that he didn’t give those, that we would need to go to room 105. As we headed to room 105, I saw room 101, 103, but no 105. So, we just went into 103, which was the assessment office. The gentleman was apologetic as he directed us to the admissions window for the number. I told him we had just come from there, but since we were here, we needed to take the assessments and could Brian do that today after retrieving his student ID number? He said that he didn’t have any openings until the 20th of August and that they fill up FAST. I had called previously on the assessments and while they didn’t have to be taken at LACC, they could be taken at any community college in California… just not in Illinois. So I didn’t get too upset since I knew we had alternative options. So, we headed back to the window, where the guy told us room 105… I told him that they sent us here, we have a number and we just didn’t know it. To which Brian handed his high school student ID and received the number. We then went to the counselor’s office, which closed at 6:00 and it was about 5:30. Luckily someone was able to speak with us and told Brian if he was planning to transfer to University of Southern California they liked A’s and gave the list of general ed classes needed along with the film and cinema program courses. She also explained the costs of tuition – in state vs. out-of-state and that he needed to establish a residence as soon as possible. I told her that was next on the agenda. She also directed us to the financial aid office that we should go into the courtyard, turn between those two buildings and then there are bungalows on the right, one is financial aid, the other is student services to discuss Brian’s IEP. As we walked to the first turn, Brian said that he was tired and I agreed, “me too.” He said he didn’t sleep for the last two days on the bus and asked what time I got up. I told him 3:00 a.m. and he said, “Oh my gosh, what?” I said, “Yes, I got up at 3:00 a.m. to get to a 6:00 a.m. flight to LA so that I wouldn’t miss your bus arriving. See how much I love you?” To which he responded, “I am starting to see that, yes.” Well, by this time we had turned the corner and I saw buildings for Radiology Technology and other things, but not the financial aid or student services building. Since it was nearing 6:00, I told Brian, let’s just come back tomorrow after we have gotten some rest and can maybe find the building? He agreed, so we left for the hotel. He did ask me if I wanted to see some sights that we didn’t get a chance to see when we were out here on vacation several years ago, like the La Brea Tarpits or the Santa Monica Beach? I told him we could do that if we got his apartment, college classes and job secure because that is what I was out there for. We checked in and walked up to the room to find that the key cards they gave us didn’t work. So, we went back downstairs… and they gave us new keys. We went to the 8th floor and this time, they worked! Brian said he needed nail clippers and I said he needed a shirt that wasn’t able to stand on its own. There was a Walgreens caddy cornered from the hotel, so we went on an adventure. We got the clippers, a California t-shirt, some breakfast bars and chocolate milks to drink. Then we decided to walk a few doors down to Chipolte to grab dinner and return to the hotel to relax/rest. We got to the room to find that they didn’t have a fridge in the room. So, we just drank our chocolate milk like dessert. That was pretty much it for that day. Tuesday morning I wake up rather early in California time, about 4:30 a.m. – it would be 6:30 a.m. in Illinois. So, I got up and got ready, then woke Brian up so we could go looking for apartments. First he tried calling Greyhound to see if they had his luggage, but kept getting a busy signal. Brian found two different studio apartments that he felt he could afford and would be relatively close proximity to LACC. We started by calling them. The first one, the landlord answered and said that he had no vacancies, but to check back at the end of the month and he may have some once he knows who gives their 30-day notices. I thanked him and called the next apartment. I got a message machine, left our name and number and what we were looking for. Then we started looking at other options. I looked up the second apartment on a review sight and told Brian it said that they intermittently shut off the water during the day with no notice, the electricity goes out often and that there was a considerable amount of gang violence. He said we could mark that apartment off the list then (the landlord never called back anyhow.) Brian found another studio, so I dialed it up. Lucas answered and was very helpful. He said he didn’t have any studios, but did have a one bedroom that rented for $2,900 a month. I told him that was a bit out of Brian’s budget (about $2,400 over). He looked at sister properties but they were all higher rent than what he offered. Then he gave us two great websites to use. The websites sorted by price and I started with the lowest and called about 15 different entries. Out of those 15, 12 had disconnected numbers. I told Brian that I was kind of concerned if they couldn’t keep their phone on! Two of them I left a message and the last one there was not a message machine – so it was crossed off the list. If I can’t get ahold of you to rent, how much better will it be when I have an issue in my apartment?? Then the person from the autism resource center that I had left a message for called me back. She was very helpful without being helpful. Again, since he didn’t have an address, she couldn’t help him because they serve by address and that it would take 120 days for intake to determine services needed, etc. I asked if she had apartments that would be a good fit for Brian but she said she did not. 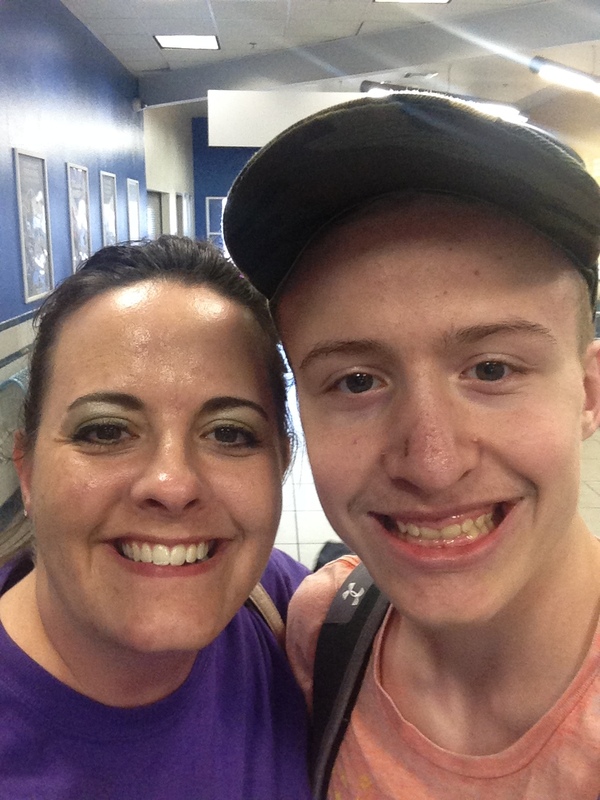 Once he establishes a residence, they can start the intake process and will offer life skills, budgeting assistance, provide student advocacy – all of which will be important for Brian starting out on his own states away from his family. So, we will keep that information for when Brian does go to LA. At this point, I had given up on apartments, but thought, a call to University of Southern California might be a place to try – if nothing we could get the assessments taken maybe? *He would have to work close to full time to pay his rent, tuition, and food bills. *Mom and Dad cannot pick up costs, it is all on his pocketbook. *Time – he wouldn’t have to work full-time, could work part-time if wanted. *Allows more time to focus on homework and get A’s and B’s. *When general ed is done and accepted to USC, we will pay for his ticket out there and travel with him to get him settled. -Drive by first apartment building Brian found, observe area. -Drive by second apartment building mom found, observe area. So the first order of business was to go to Greyhound. Low and behold, they DID have his luggage!! This saved us a bunch of shopping, as all his jeans were in the case and 29×34 are HARD to find on the shelves! Drove by the first apartment, it looked like a possibility, as did the second. Then we drove towards Griffith Observatory…. I was not prepared for this drive up Mt. Hollywood…. I got sort of dizzy at the top and we couldn’t find a parking spot for anything so I begged Brian if we could just go to the tar pits. Reluctantly he agreed and I was relieved to be on regular roadways. The tar pits were neat and they really did smell like hot tar. We took a few photos there, then headed out for Yogurt Land. After we left Yogurt Land, my scriptwriter friend, Lisa called us. She couldn’t meet us for dinner at Buca di Beppos, but did have a conversation on what Brian should do to break into the business. He will start looking at internships in the spring. Then we took off for the Santa Monica Beach and to eat at Buca di Beppo, where the stars are seen eating at times. Well, we didn’t see any stars at Buca di Beppo, but we ate a dish of cheese ravioli with meat sauce and headed out to the pier. We walked the pier, then walked the beach, then returned to the hotel and began preparations for our departure the next morning at 7:00 a.m. While this trip did not occur in a manner that I would have preferred, we did have some fun together after working to find a place for Brian to live. And he is still going to go to LA, it is just a matter of when. Brian says 5 months, but I don’t think he will get the general ed classes completed in that amount of time. I told him if he gets all the general ed classes done while living with us, going to internships in LA during the summers, when he transfers to USC, he will have housing there, food there and it will be an easier transition. While we were in LA, I asked Brian if he remembered how he felt when he went out to feed the dogs and bring them in the garage because it started to snow and Beau was missing and he couldn’t find him before he got on the bus? He did. Told him that was how his dad and I felt when we came home and he was gone, times 100 at least and then we couldn’t reach him on his phone. I asked him to promise never to do that again. All I can do now is pray for the best and help him get his general education requirements done, scholarships applied for, and college admissions forms completed. It’s tough being a parent. I have an Asperger’s son and a non-Asperger’s daughter. Each came with their own challenges. One thing I can say about raising an Asperger’s son is that he has taught me more about how to interact with others in the workplace – Asperger’s causes them to see things and understand things in black and white, they take things very literally. So, you have to be careful how you word tasks that need completed. In addition to that, not everyone thinks the same, sees things the same, and when you let all those different aspects out in a room, you can make some wildly innovative ideas. People might say that people with Asperger’s have quirks… I argue that we all do and we need to learn to understand each other. I do want to add that I am so grateful that my Facebook friends shared my status when Brian went missing and how many kept following along, praying and keeping in touch to make sure Brian was found, that he was okay, and that we were okay. So many people messaged us and it really was heartwarming to know that there are people out there that do care about the safe keeping of others. Within an hour, I had 1,000 shares on my status. By 2 am, I believe it was up to 5,000. Simply amazing and we are overwhelmed by your concern and assistance in finding Brian. We even had people offer airline miles, to take a collection, etc. Not necessary, but so very heartwarming. Thank you for your shares, prayers, and concern!